With the modern age making entrepreneurship in fashion and greater profits for existing businesses more attainable, a problem quickly arises: office space. Privacy can lead to focus for employees, which can lead to greater productivity and finally greater results, and that calls for a cubicle that helps this concentration. However, investing in so many cubicles can quickly feel like shooting yourself in the foot – saving money and making profits is the name of the game, right? Every business knows that saving money isn’t just about cutting on prices and finding deals – it’s about conserving the time and effort your employees are spending on tasks. This applies to ensuring productivity is kept up and small delays don’t lead to a missed deadline. Cubicle panel extenders offer this same advantage by offering privacy and focus to your employees, allowing them to focus on their work and not the distraction of a water-cooler conversation or nearby clients conversing on a separate project. The savings don’t just stop there – the very way they’re built is designed to save time, and inherently, save you money. Whether you’re a handyman who can install the most difficult of objects in a matter of seconds, or you’re the less crafty type who struggles with installing a light bulb, the cubicle panel extenders are designed with ease and efficiency in mind. If you’re remodeling your office space and find privacy as a key to success, you can find yourself in a jam for time with traditional cubicles that can take as much as a day to put in place. However, the extenders are as simple as a few moments of your time, an Allen wrench, and a handful of screws, allowing you to transform your office without cutting into your deadlines. Success is about innovation, and that may mean redesigning your office space again in the near future. With normal cubicles, you’d find yourself in the same bind all over again, with the need to disassemble, move, and reassemble the spaces over the course of a day – if not many days. These extenders offer the same speed the first time as they do in the last, and readjusting the angle or moving them entirely can be done in a matter of minutes, saving you valuable time and money with it. When success comes knocking at your door, it comes with a handful of problems to join it. As your business expands, this means hiring more employees and purchasing more equipment to handle the workload, and while your company may be growing, it doesn’t mean your office building is. To avoid tight workspaces that result in more headaches and frustration than productivity, arranging cubicles in the most economical and efficiency way is the answer. The more people you can fit in a room, the less rent you’ll pay on a larger building, and the more productivity you can achieve through collaboration. Cubicle panel extenders it all in one. Traditional cubicles keep to a very strict size and level of flexibility, making your dreams of a pillow-fort style office space hard to come by. Cubicle panel extenders, on the flipside, offer a level of flexibility and creativity, allowing you to extend them as far as you’d like or angle them in certain directions to keep from irritating your co-workers in tight spaces. 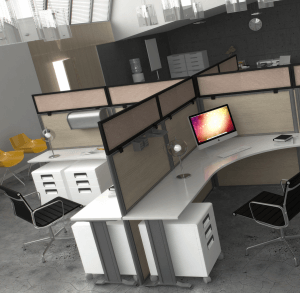 With their compact size making it easy to match up several to achieve a certain angle or only reach so far, you can create the cubicle space you want in a shape that suits the greater good of the office. Of course the greatest money-saving advantage is the simplest – cubicle panel extenders can literally save you money. This is accomplished not only by their more reasonable price range and compact size, making it possible to buy fewer to suit your needs, but in greater ways. Some cubicle walls require an array of different tools and pieces to come together, with special adjusters, drills, and even unique screws stacking on the price tag in addition to its expected cost. Cubicle panel extenders are made for the future, with efficiency and ease in mind, and they accomplish this by coming entirely self-contained. Each features an Allen wrench with the packaging, all the screws needed, and no specialized parts that you have to search out last minute, making it possible for you to account the cost and then trust it. As your business grows and more space is needed, maybe you decide to go the simpler route and upgrade to a larger office building – but the costs don’t end there. Now you’re in dire need of more cubicles to accommodate new employees and collaborative projects. How can you manage all of it without racking up the price tag? Cubicle panel extenders allow you to use the traditional cubicles you already have and make them larger, at a significantly lesser cost. Now you can create that awesome hacker-style desk space with a wrapping panel making your area larger, all without the price tag you’d have to hack a bank to afford.